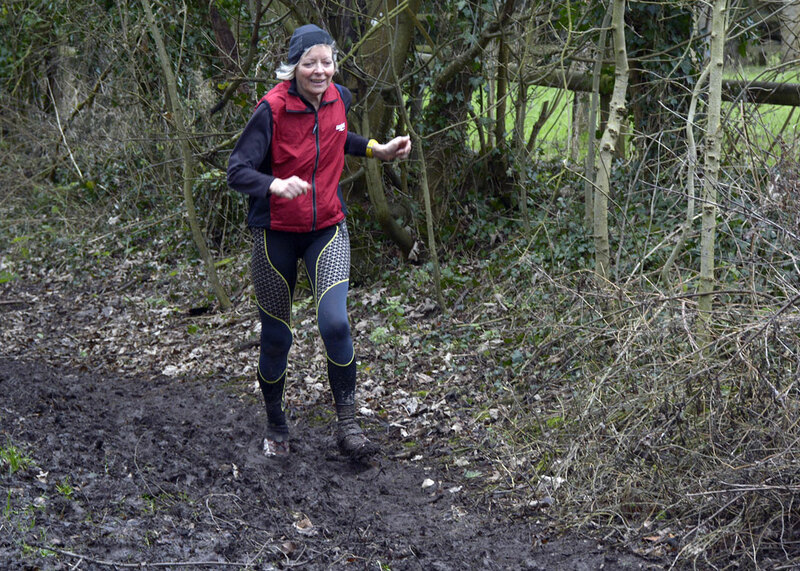 Lesley Pymm reports: This was billed as the hardest trail race in Wiltshire. I don’t think I have done any other races in Wiltshire, so nothing to compare it with. Anyway, we got to the start in good time and used the official car park which meant a longish walk to the race HQ. I rationalised that this would be good afterwards as I would need the walk. We had a coffee before the start and generally hung around wondering what to wear. The sun was shining, but it was pretty cold and threatened to be windy on the tops. Eventually I settled on a gillet, hat and gloves. Standing at the start in the sun I wondered if that was the wrong decision – the sun was certainly warm. Anyway, too late to worry about that as the event started and I was shuffling down the road through the village of Milton Lilbourne with 500 or so others. We soon went off road and were going along a track that was quite muddy. We turned and went downhill and the path narrowed. I was soon standing in a queue (it was a bit like the XC at Droitwich the day before) and wondering what was going on. It soon became apparent that there were people there who did not want to get their shoes dirty! Why they were doing an event sub-titled ‘mud, sweat and hills’ is beyond me. We passed the very muddy bits and started to run again. We turned off and over open country and suddenly the sun was in my eyes and I couldn’t see very much at all. I was just watching the ground and hoping for the best. Then suddenly the sun was shielded – I looked up and realised that the first of the hills was providing some shade! 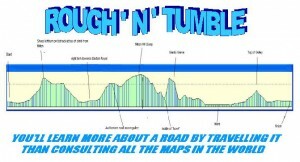 I could see the race route going diagonally up Milton Hill and then a line of runners on the ridge at the top. Marshals on the way up informed us that this was the warm up hill! On the ridge the wind picked up and it was pretty hard to run. There was a downhill that seemed harder than the uphill as I was trying to run against the wind. I was so cold and really pleased with my clothing choice! There was a lovely long downhill track to the Gully and the village of Easton Royal where there was a bit of road running. Off road again at about 5 1/2 miles we started to climb gradually before turning to the left and climbing less gradually! The sign said: ‘This is NOT a hill’. It seemed pretty like one to me ( a short one) but then when I got to the top I could see the short downhill leading to the BIG climb! Looking up there were people ahead of me on all fours. A sign here advised: ‘This IS a hill’. I don’t think anyone was disagreeing. Another notice said: ‘Go up or go home’. I managed to do most of the Giants Grave upright, although there was a short section where I had to crawl. Eventually I was at the top and tried to run on the ridge. Not possible. There was so much wind that I was hardly moving. I had finished. Just over 10 miles in about 2hrs 23 minutes. It was hard and real good Grizzly training. Great cakes – which had been reduced to half price by the time I was ready to get them. 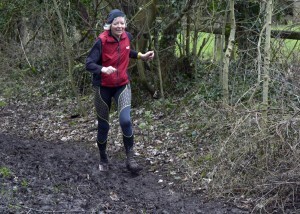 Mud,sweat and hills `on all fours!` Masochism might come to mind. 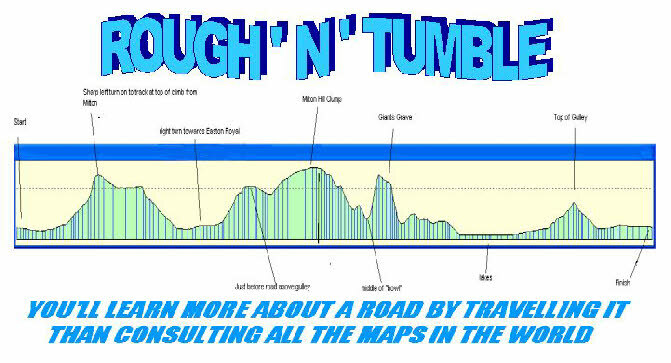 `When the going gets tough,the tough get going.` —- And we know you are tough and resilient Lesley.Certainly not a race to spend too much time studying a road map! I looked up some comments via Runners World. Thankyou for your Race Report Lesley. Great photo shot by Mike.